1. Orginally Riniker, meaning one from Riniken. This family had civic rights (1666) in Schinznach and Hapsburg. 2. Deubelbeiss is the Germanized form of the Swiss name Dubelbyss, meaning one bitten by the devil, a family (extinct since 1715) from the city of Bern. 4. Kloti is a very old family that is documented in the city of Zurich since the 14th century. The name litertally means a clumsy, awkward, plump person. 5. Steiner could be (1) one who lives on or near a rock; (2) one who sets stonemarkers in the fields; (3) possibly from the form Steimer = given name "Stainmer." 7. One many spellings derived from the given name Hilboldt = "Hildbald." 8. From schaffenaere, schaffer = a supervisor, organizer, administrator in a position of trust; one who may order people around. The informaiton on the derivation of these name comes form Walter Angst, our Swiss-born consultant on matters pertaining to Switzerland. 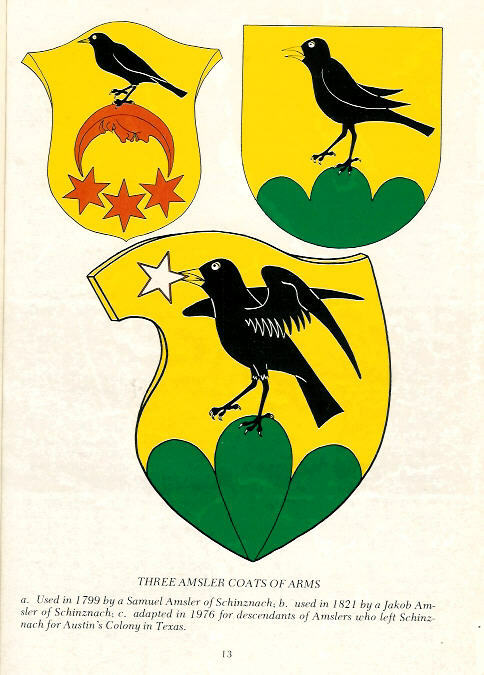 Click on link below to return to coat of arms on main page.